Sem- I & Sem-III Review Date-04.04.2019 to 10.04.2019. Pay online and submit your review application through BKU website. Submit the hard copy of review form and payment receipt to college office within 10th April 2019. ➧ Application invited for recruitment of four security guards of Panchmura Mahavidyalaya. ➧ Semester-II Hons students List with MIL subject. 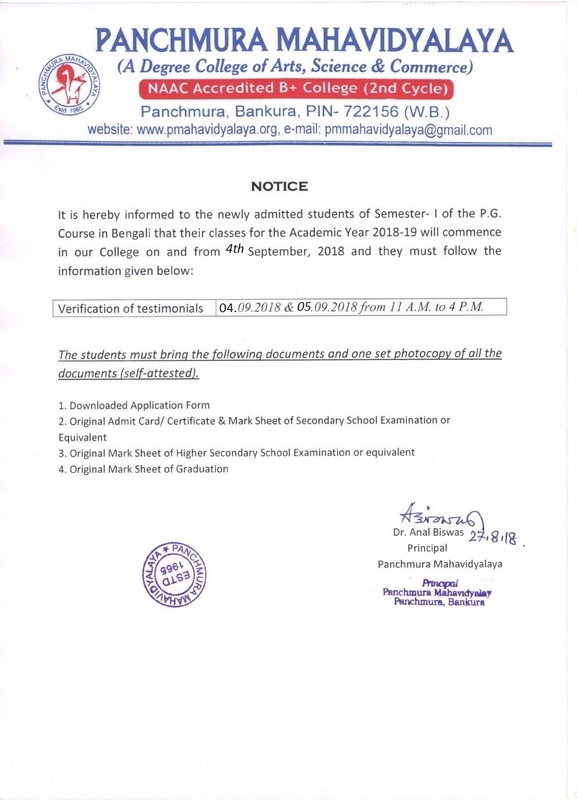 ➧ Notification for admit card download for Sem-I & Sem-III students. Quotations are invited for making Students’ Identity Cards. Interested publishers/vendors may send advance copy of the quotation in pdf file with in 3.00pm of 27.6.2018. Three salient feature of teaching-learning those are practiced by almost all the departments. 1) Modular Curriculum using DDTP: Syllabi in all Honours and General subjects are unitised in the form of Detail Departmental Teaching Plan (DDTP). They provide information on topics/chapters to be studied and when and who will deliver the lessons. Subjects’ modules are available in the library and respective departments. 2) Modern Methodology of Teaching-learning using ICT: Within the capacity of its human resources and infrastructural facilities, several departments of the College apply state-of-the art educational tools and up-to-date technology in most of the courses and programmes it offers. Delivery of lessons using Internet and Communication Technology is practiced by most of the departments. 3) Interactive Methodology of teaching: Several departments organise seminars, quizzes, debates, extempore where students participate to deliver lecture that demonstrate their understanding, and knowledge in the subject. In addition, reputed resource persons are invited to lecture in seminars, conferences, workshops that are organised by the College for the benefit of advance learners. Performances of the students in achieving courses objective is judged by taking several unit tests time to time. Successful students in the Test Examination are allowed to write in the University Final examination. Progress Report Sheet of each and every honours students are sent to their guardians. All the honours students are mentored by their departmental teachers in groups. They provide academic as well personal counselling if and whenever required and communicate with the guardians on performance of the students. Under the existing rules and regulations of Bankura University a student has to appear in Semester-I after at least ninety days of teaching days.